call 877.860.5831 for more information or www.bitxbit.com. 'Why hosted VoIP makes sense for SMBs' is succinct and well stated highlighting the fact that hosted services mean that SMBs' management can run the business with one less diversion from the management demands of core business. A babyTEL centric prediction is that 2015 is the year that Voice transcription to text and voice recognition will come of age driven by the latest generation of smartphones. Find yourself in the article on how famous execs run business. After you find yourself, check if others agree with your assessment. There could be surprises. Enjoy this week's selection of articles. According to the RightScale 2014 State of the Cloud Survey, 94 percent of organizations surveyed are either running applications or experimenting with Infrastructure as a Service. One of the more common services that small to medium-sized businesses (SMBs) are turning to in the cloud is voice over IP (VoIP) for their unified communications needs. Cloud-based, or hosted, VoIP services provide SMBs with benefits that help equalize the playing field against larger businesses and move them away from the antiquated technology that runs most traditional telephone services. Wireless charging is a convenient way of topping up your device's battery, and new technology is on the way to make it even better. At the moment it can take quite a while to fully charge batteries via a wireless charger as the technology can only run at a rate of 5 Watts. Digitalization and the digital business are catalysts of change that are affecting the human-machine relationship and driving better customer outcomes. The top 10 predictions indicate that computer-based machines are taking a more active role in enhancing human endeavors, because the machines are more connected than ever before, they are sensing their surroundings, and they are becoming smarter. Because of this, they have an increased ability to supplement (or even supplant) human jobs and to reduce the cost of operations. All in all, the trends indicate a near-term future in which machines and humans are co-workers and, possibly, even codependents. Americans sit through some 11 million meetings every day - with the unproductive ones costing companies $37 billion a year. We've already learned that meetings fall apart thanks to sloppy agendas, un-articulated ground rules, and other structural mistakes. So we decided to look at how some of the most effective executives in history - from GM czar Alfred Sloan to Apple prince Steve Jobs to Facebook queen Sheryl Sandberg - run the meetings that invariably fill their calendars. © Copyright 2014 by babyTEL. All Rights Reserved. Every little thing you do. Better with these new features. Meet the new feature that lets you work together in Evernote more effectively than ever. Do the work, share the work, talk about the work—all in one place. 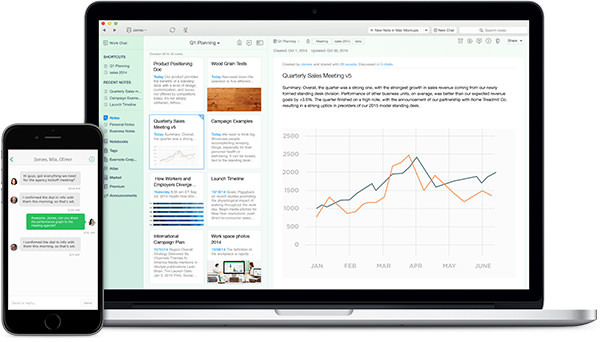 We're reaching out to let you know about an issue in Apple's new OS X Yosemite that may affect your team's use of Dropbox on Mac computers. Your users can resolve this issue by installing the OS X Update 10.10.1 on all of the Macs in your company running Yosemite. (If your company is not running Yosemite, you can ignore this email). Apple's new OS X Yosemite may occasionally cause some programs to crash when users open, save-as, or first save a file. These crashes are rare but happen when an application, such as Dropbox, uses Yosemite's official Finder integration — and if that program crashes because of this interaction, unsaved changes may be lost. To fix this issue, Apple has released OS X Update 10.10.1. This update is available for free in the Mac App Store. Details on how to update your team's Macs are available on Apple's support site. Your business reaps many benefits from modern technology. No longer do you need entire warehouses to store your paper files. Millions of pieces of information are available with a few keystrokes instead of being buried in filing cabinets in the basement. Your employees carry cell phones on the road and at job sites, which allows you to communicate with them at all times. Photos come on tiny flash drives, proofreading and spell checking happens instantly in your word processing suite, instant messaging and email smooth the flow of inter-office communication, and customers can shop on your website without ever leaving their homes. Business technology is ubiquitous and powerful. You're not in a hurry to go back to using typewriters and whiteout, but the vast array of technology that your business relies on comes with its own set of challenges. Modern technology is more reliable than ever before, but failures do happen. Technology also moves quickly, which means it is difficult to stay on the leading edge in every category. For many businesses, it simply does not make sense to keep a dedicated IT staff on hand to handle occasional upgrades and rare failures. This is where information technology consulting enters the picture. Information technology consultants are useful at all stages of applying technology to your business. From initial design, to maintenance, to emergency response for major technology crises, IT consultants have the skills and knowledge necessary to serve your business's hardware and software needs. Before implementing a new technology scheme, it makes sense to seek the advice of a professional technology consulting team. Are you planning to upgrade your office LAN, or implement a VPN for your remote workers? Do you want to connect multiple offices with a WAN solution? Hire a consultant to ensure you are pursuing the right solution for your problem, and to guarantee the smoothest user experience and maximum uptime. Are you thinking of adding a local backup solution, or an inter-office messaging system? You don't have to fly blind, there are consultants who deal with these things on a daily basis. Information technology covers everything from bar code scanners to smartphones. Whether you want to be sure that your mail server supports all your users' mobile devices, or centralize authentication for all of your servers and applications, or reduce your reliance on third-party hardware solutions, there are consultants with the know-how you require. With IT consultants, you only pay for what you need. Maintaining your own staff of technology experts with knowledge in every field can severely impact your bottom line, especially when dealing with niche subjects, or rare catastrophic events. It doesn't make economic sense to maintain the expense of an employee whose special skills may only be needed a few times per year. With IT consultants, you get the benefits of subject-matter experts without the expense of maintaining your own IT staff. Business technology should make your life easier, not harder. The point of modern IT is to increase productivity, increase profit margins, and reduce headaches. If you find that this is not the case, you may need someone to look over your processes and infrastructure. Hiring a business technology consultant can be the key to getting your technology once again working for you rather than against you. To start, click or tap the 'New Note' or '+' button when you open Evernote on your computer or mobile device. Type anything you want to remember later or save text, attachments, audio and more. Put it all together: save text, attachments, audio and more, all in a single note. Turn your notes into actionable Checklists and Reminders and get more done. Get your home life in order. Create a checklist for errands and add a Reminder so you remember when to pick up the dry cleaning or take Fido to the vet. Tackle work projects. Make to-do lists so you can stay on top of tasks, whether you're on the bus, at home or in the office. Reminders help your team manage the various deadlines and deliverables along the way. Plan travel. Create a packing list or an itinerary to get the most out of your trip.